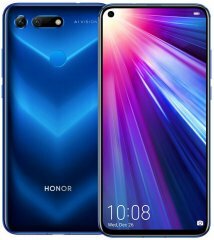 One of Huawei's highest-specked photography smartphones, the Huawei Honor View 20 threatens some popular imaging-driven models featured here on Phonerated with its premium-class 3D-enabled dual rear camera , which consists of a whopping 48-megapixel standard cam and an accompanying 3D cam, together enabling things like 3D depth-sensing, real-time motion capture, and skeletal tracking. Furthermore, its ultra-high-end (at least around the time we were reviewing its pros and cons) dual camera enables 3D motion-controlled gaming , basically allowing users to play 3D motion games and treat the View 20 like an actual motion-controlled gaming console. Speaking of gaming, this Huawei flagship brushes shoulders with some of the fastest smartphones when it hit the market, running on Huawei's self-branded triple-cluster (dual 2.6GHz + dual 1.92GHz + quad 1.8GHz) Kirin 980 7nm processor alongside a massive 8GB RAM and a liquid cooling system . Those flagship-class pros aside, the View 20 is not without a couple of cons, one of which is its lack of a microSD card slot for storage expansion , although its large 256GB inbuilt memory is by no means disappointing. The View 20's display is not as ambitious as we had hoped either, coming in the form of a 6.4-inch interface sitting on a 2310 x 1080 FHD+ definition and an unimpressive 398ppi pixel density score . 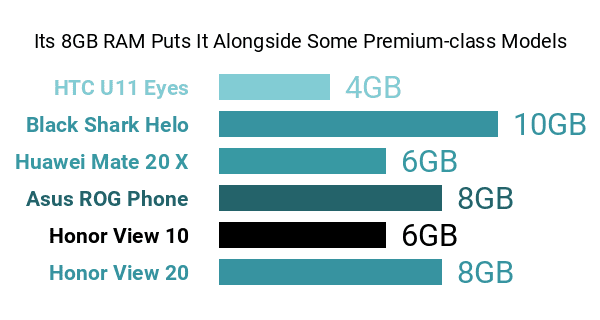 In comparison, some of the best phablets and large-screen phones on the market strut around with QHD/QHD+ (1440p) definitions and VR-worthy pixel density counts of over 500ppi. Nevertheless, its aforementioned facade still makes the high-end cut, especially since it features a rather innovative in-screen 25-megapixel front-facing camera that might plug this Honor View edition into our list of the best selfie phones available. Its pros and cons are powered by a respectable 4000mAh battery that boasts some above-average stress test scores, including a 25-hour 3G talk time and a 130-hour continuous audio playback time . This Huawei flagship runs on Android 9.0 Pie skinned with the brand's Magic UI 2.0.1 and it is offered in colors like Phantom Red and Sapphire Blue. So, with a couple of premium-caliber specs up its sleeves, the Honor View 20 obviously caters to tech-savvy users who are heavily inclined to mobile gaming and photography.